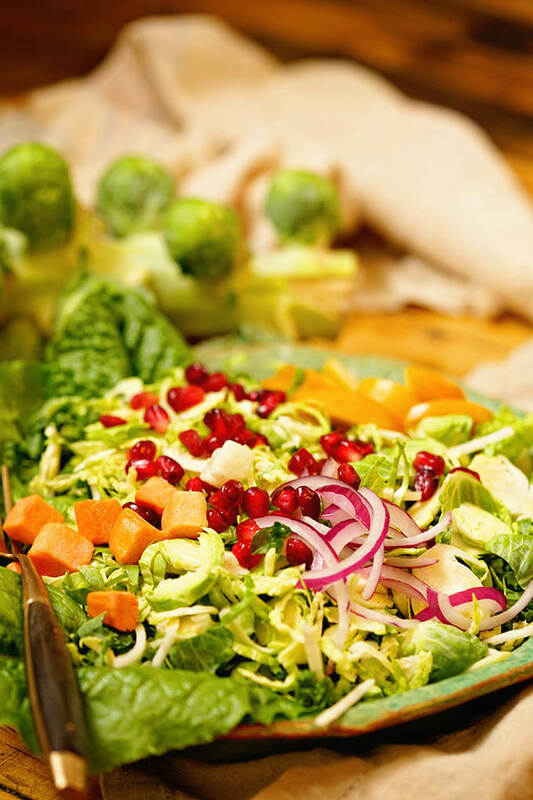 Shaved Brussel Sprout Salad Recipe with crunchy greens and tangy brussels with bright fresh fruit. Top your salad with creamy or tangy balsamic dressing. This is great side salad or an easy lunch for any time of the year! Whether you’re serving this as an easy lunch or great side dish a Brussels sprout Salad is a great addition to your meal! 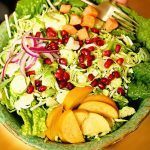 I realized when I posted my Steakhouse Salad Recipe recently how much I’ve neglected my salad lovers! It has just taken off with 9,000 shares and counting. Shame on me, that won’t happen again, I promise! At heart, I’m definitely a soup and salad kinda gal. Casual comfort food is probably one of the BEST ways to describe my blog, wouldn’t you agree? Yes, I think so too! So having said that… I have a new salad for you today! This shaved brussel sprout salad with Lemon Vinaigrette is a tasty crunchy salad! It’s delicious because you can top it with your favorite fruit and a creamy salad dressing. Fresh fruit top this salad and it’s a great addition to any meal! You can certainly take a shortcut and purchase a premade salad dressing – no judgment! If you do, get one that is creamy and citrus based or even coleslaw dressing! Those flavors compliment this salad mix. How to shave brussels sprouts? With a food processor – Clean the sprouts well. Remove and discard the core. Use the slicing blade and feed the sprouts into the tube pulsing the machine to process. Avoid overprocessing. With a mandolin – this is the best way to thinly shred the sprouts, but also the most dangerous. It’s so easy to cut yourself! If you do use a mandolin, protect your fingers with a slice-proof glove. They are inexpensive, no reason not to have them if you use a mandolin. Using a mandolin, set the blade to a thin cut and hold the end of the sprout and carefully shred. Discard when you reach to core. Shortcut tip! Purchase a bag of pre-shredded sprouts at the store. Just to be sure to check the sell-by date so they are fresh. Roasted butternut squash, creamy chunks of avocado, walnuts, pecans or almond slivers are always a great addition to this salad! How do you make brussels sprout salad? Don’t feel like making your own salad dressing? No judgment! I’ve even used the premade salad dressing that comes right in the kale salad kit, delicious! 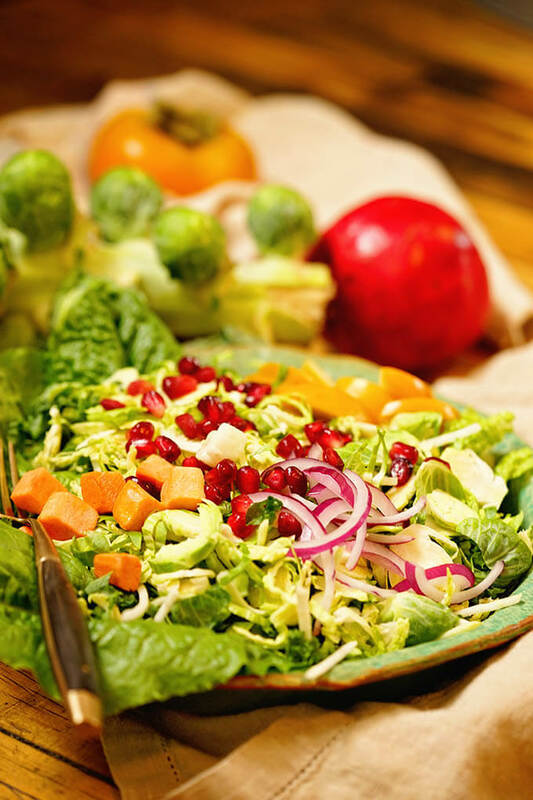 Brussel Sprout Salad – top it with your favorite fruit and a creamy salad dressing. Here are a few more of my favorite green salad recipes! Affordable slice proof gloves – check them out here. Love it? Please share your comments below along with a five-star rating. You’ll make my day! This is definitely a great photo op too because this salad is gorgeous! Don’t forget to snap a pic and tag me on Instagram @bowl_me_over or #bowlmeover – enjoy!! Shaved Brussel Sprout Salad Recipe is packed crunchy greens and tangy brussels and is topped with bright fresh fruit. Dress your salad with creamy or tangy balsamic dressing for a great side salad or an easy lunch for any time of the year! Add the pre-made kale salad dressing to a large bowl. Clean the brussel sprouts. Carefully slice or shred - add them to the salad. Thinly slice the red onion, core the nectarine and slice into wedges or dice it. 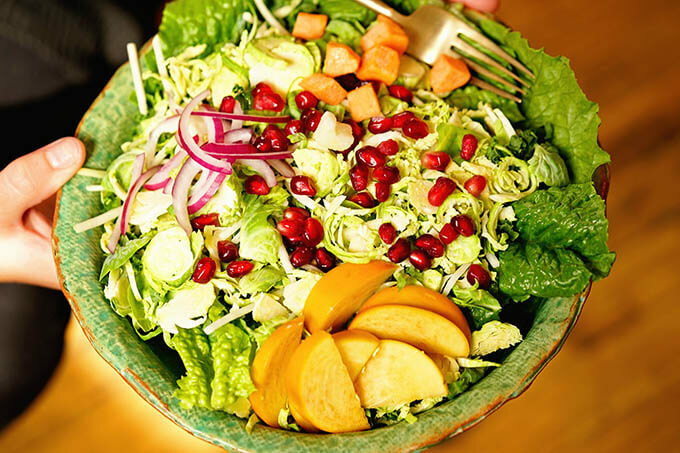 Top with pomegranate arils and your favorite creamy or balsamic salad dressing. Enjoy! Brussels sprouts never looked so good! Ha! One of my favorite photos just love the colors and textures. What an awesome idea! I Love the brussels and this salad is so perfect for Spring! Thanks! I love shaved brussels salad. They are so smooth and delicious. Your addition of the peaches and onion are the perfect contrast. So much color and texture. This is lunch this week! Thanks Julie – It’s such a great combination and contrast of flavor and texture. Great salad, I hope you really enjoy it. That’s wonderful, thank you Kylee! This salad looks out of this world delicious!!!! Brussles sprouts are my favorite thing to add to my salads!! I can’t wait to make this salad! They add so much texture and crunch!! Shaved Brussels sprouts are our new favorite thing! This will make an appearance at our house very very soon! I’m a big fan of sprouts, just love all that crunch and texture – enjoy! Looking forward to a new salad! I’ve never tried Brussels sprouts in a salad. I’m in for a treat, especially with that lemon vinaigrette! Thank you Sandra, I hope you love it as much as we do! What an awesome side dish idea! This is such a great way to use up brussel sprouts!